Etekcity's Digital Clamp Multimeter makes household electricity maintenance safe and simple. While having the capability to test AC/DC voltage, resistance, continuity and diodes, the built-in clamp enables you to measure AC current without needing to break circuits to come into direct hazardous contact. With a capacity of 400amps, the clip can comfortably extend to test cords and wires up to 28 mm in diameter. The multimeter also includes safely insulated test probes with plastic gripping for safer handling while measuring. and easier. 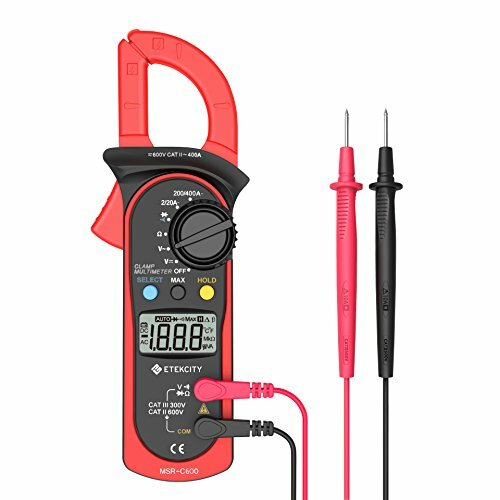 This device is the perfect startup multimeter for entry-level electricians, hobbyists, and general household uses.